Earlier this week, the creator of indie crossover hit Minecraft revealed an impressive statistic – the game, which started out as the personal project of creator Markus “Notch” Persson, has now sold over 33 million copies worldwide, on PC, Xbox and mobile. This chunky combination of adventure game and Lego construction set has beguiled players for over two years, without a multimillion-dollar development budget, or blanket advertising. At first the success of the game was puzzling. Its procedurally generated worlds are constructed from hefty blocks, giving the environment and everything in it, a simplistic, retro look. Originally released as an unfinished beta version, players had to wade through software bugs and mechanical uncertainties, using the game's complex crafting system to build homes and contraptions, but having to share information on what worked where – there was no tutorial. But actually, that has been a part of Minecraft's beauty. It is an organic creation, not just because every time you start a new game the whole landscape generates anew, but because it has been developed in tandem with play. Game modes, new monsters, new features, new farm animals – many have come and gone, and then been tweaked and changed and put back in – often in response to user feedback, like one giant science lab. Very basically, there remain two different experiences: the Creative mode which gives you access to all the building blocks and “mobs” (AI characters) in the world allowing you to build anything you want; and the Survival mode, where you must mine for minerals with which to craft items and weapons, while avoiding exploding creepers, giant spiders and lurking zombies. In this mode, players have all day to explore and build, but when night comes, the monsters are abroad and you must return to your self-built house. Safe and warm. This is particularly resonant to me, and I suspect many other parents with autistic children. My seven-year-old son, Zac, was confirmed on the scale earlier this year, although in a lot of ways we've always known. He has a somewhat limited vocabulary, and finds noisy social situations like schoolyards frightening and confusing; he is demonstrative, but has difficulty with empathy. We have watched as his younger brother, Albie, has overtaken him on things like reading and writing. But he is funny and imaginative and wonderful. And like a lot of children with an autism spectrum condition, he loves Minecraft. From the moment I downloaded the Xbox 360 edition and handed controllers to him and his brother Albie, they have been addicts. At first, they simply trudged across the rolling landscapes, randomly attacking the sheep, cows and ducks that graze each Minecraft world. They would throw together weird hovels, filled with random doors and windows, huge gaps in the walls, bizarre jutting extensions, like nightmarish sets from a German expressionistic horror movie. Now, they construct immense palaces and giant inhabitable robots – usually made out of gold and glass. They are the Liberaces of virtual architecture. They explore the game's growing systems; they avidly download all the regular updates which add new features, new creatures, new narrative possibilities – they devour them all. It is a beautiful thing to watch, not least because Zac sometimes finds the world as we know it inexplicable. Guiltily, we have often laughed at his constant refrain of “What? !” whenever we talk about or point out something he doesn't understand. He jokes about it too. “I'm good for nothing!” he wails in mock misery when he mishears or fails to comprehend something the rest of us got instantly. For Zac, Minecraft represents an utterly logical yet creatively fecund world that he can explore and manipulate on his own terms. If people with autism crave order and control, Minecraft provides it, only within an environment that also allows and rewards discovery. Each room of the Minecraft library offers a clue inside treasure chests tucked into the virtual shelves. Clues provide students with a summary of the plot, title, author, and call letters – so children can locate the books inside the physical library. Beyond this, Minecraft is now being widely used in education. Geography teachers get children to model real-life buildings or villages; physics teachers use it to teach simple fluid dynamics and mechanical properties. Minecraft developer Mojang works with an organisation named MinecraftEdu, which distributes a special version of the game to schools with extra educational tools. The game has also been picked up by Autism charities, which run dedicated multiplayer servers where autistic children can meet up and create together. AutCraft in the US and APTTA Craft in the UK are two examples. Meanwhile, the game keeps growing. Updates are regular, and a new “Mash-Up” pack has just been released for the Xbox 360 version of the game which changes all the landscapes, characters and items to resemble the sci-fi action adventure game series, Mass Effect. “It's been a great team effort and everyone worked really closely,” says Roger Carpenter, Minecraft's Xbox producer. “Much kudos must go to Mojang for being open to the idea and Bioware for letting us play with their IP too – there's been lots of input from all sides. It has been a long time in the planning but we wanted to offer something familiar yet new to Xbox; to add new aspects and grow the concept. New Mash-Ups are expected to follow, and Carpenter says the next has already been developed. I know my sons will enjoy them, even though they don't know Mass Effect – it's just a new landscape to explore. To them it'll be like switching from regular city Lego to space Lego. This is the point. Everything is about personal creativity. You want to build a scale replica of the USS Voyager? Sure, why not? Minecraft's biggest audience is the under-16s and Zac's enthusiasm for the world has taught me why. Minecraft and everything in it is theirs; it bends – unlike so much else in their lives – to their will. When I play Minecraft with Zac he gets to explain to me the vagaries and complexities of his saved kingdoms – the traps he has built, the hidden boltholes beneath looming mountains, the crops he has planted, the eggs he has nurtured, the places he goes, the things he sees. For children the world is still a flexible, plastic construct, and then the dogma and sense of adulthood drains in. 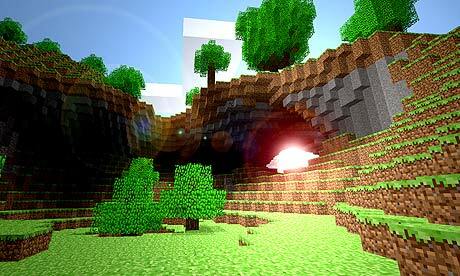 Minecraft is at that psychological cusp, that liminal zone between imagination and reality, between revery and action. It has its own physical laws, its own stability, but for the player, the rules merely help structure the imaginative process. Everything is yours. Other games have come and gone. We've been through and enjoyed all the Lego adventures; right now Zac and Albie love Disney Infinity, which provides its own slightly more dictatorial toy box mode. But like millions of others, Zac always returns to Minecraft. Its blocky landscapes – which are minimal yet no less picturesque in their own way – present limitless possibilities to him. In our darker moments as parents, we wonder how much the real world will ever offer him in terms of opportunity and control. Like us, Minecraft knows that he is funny and imaginative and wonderful. Will others? For now, all is fine, and this game is something he'll come back to whenever we let him, I suspect for many years to come. In lots of ways that I'm sure will sound familiar to many thousands of fans, Minecraft is like returning home where he feels safe.